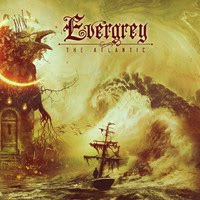 The Storm Within, the previous Evergrey album, was one of the best albums of the year 2016 and now these Swedish prog metal guys come up with another gem called The Atlantic. Evergrey's 11th album is a must for fans of melodic, heavy dark progressive metal and the album features 9 new songs and one short instrumental intermezzo called The Tidal; the latter being a multi-layered keyboards Vangelis-like song, which is probably an introduction to The End Of Silence. The Atlantic hits you in the face with the 2brutal" opener A Silent Arc which stands out due to the emotional vocals, the dazzling, heavy sound and the up tempo hooks and riffs. Furthermore A Silent Arc features two amazing ferocious guitar solos and astonishing drum passages. Weightless is a head-banging track with lots of heavy grooves and a howling fast guitar solo, which is followed by my favourite song of this album being All I Have. That track is bombastic, emotional and melancholic at the same time and it also features a magnificent beautiful chorus where Tom's very recognisable voice stands out like almost never before on any Evergrey album. Other highlights on this superb album are Currents (with amazing guitar solos), Departure (a slower track filled with lots of emotion) and The Ocean (dark with dominating guitars). The Atlantic is a strong, diverse, consistent magical album and there is never a dull moment, so a must for prog metal fans all over the world. The Atlantic will definitely be in my top 3 albums of the year 2019, so check it out and play it loud!!! ROSS BYRON - "RED & BLACK"